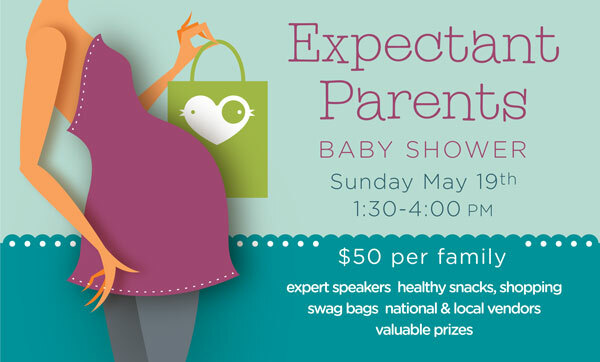 In honor of Mother’s Day, My Fabulous Mama is excited to share a free family ticket with 5 lucky expectant moms to the Nest’s Expectant Parents Baby Shower! 5 lucky moms – Free admission!!! The first 5 mom’s that “like” My Fabulous Mama on facebook (click here!) and comment with their funniest pregnancy craving will win free admission! For those of you not familiar with the Nest, its located centrally at 13th and Locust Streets in Center City. It is a membership based indoor playspace and offers enrichment classes for children from birth to six years old. While stopping in to play you can pick up a snack in their lounge, buy clothing or a gift in their boutique or schedule a time to squeeze in a kid’s haircut at their mini salon. Our family has been a member of the Nest since it first opened almost two years ago. All my kids love it there! We’ve sampled sports and music classes, parenting classes and celebrated two children’s birthdays. Joanie is my favorite instructor and runs the enrichment (mommy and me) claases. She has extensive experience running parenting classes for over 20 years and she is great with engaging each parent and child. She keeps classes light while providing informative and relevant content. All around, the Nest membership is well worth it since it provides an extra place for the kiddos to play when the whether is too hot, cold or uncooperative. The playspace is open weekdays from 9 to 6 and additionally has weekend hours. Members can drop in at anytime.